Congratulations, you've determined ozone is the right technology for your application. Now, how to choose what ozone generator is right for you. There are many differences in ozone generators, some variables will be relevant to your ozone application, some will not. It is not possible to cover every possible ozone application, therefore we will discuss the various differences and variables in ozone generators that should be considered and the general applications each may be relevant to. The ozone output value is shown in a mass over time value that indicates mass of ozone produced in a given period of time. This is the most widely used method to compare ozone generators and may be the most important for your application. Keep in mind that for water treatment applications ozone concentration is just as, if not more important for sizing the proper ozone generator. Ozone concentration is the ratio of total feed-gas to ozone production, or how efficient is this ozone generator at converting oxygen into ozone. In a water treatment application, ozone concentration is very important as it will affect the solubility of ozone into water. In applications where high dissolved ozone are required ozone concentration is the most important variable as this will dictate that maximum dissolved ozone level in water. When using oxygen for ozone production ozone concentration is very important as an ozone generator that produces ozone at a lower ozone concentration will require more oxygen to produce the same g/hr ozone output. This may increase capital costs for oxygen generating equipment, and increase long-term operational costs due to higher energy demand. 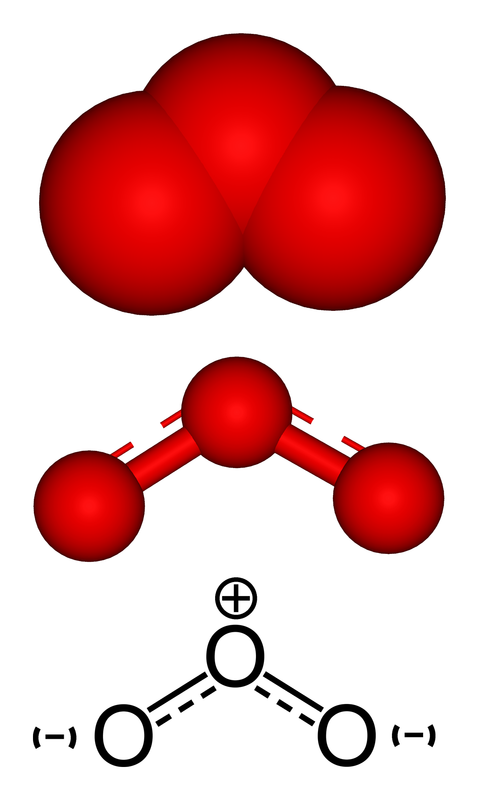 Ozone can be produced from either oxygen or dry-air feed-gas. Ozone is produced more efficiently from oxygen than air as there is more oxygen to produce ozone from. Most ozone generators produce 2 – 3x more ozone from oxygen than from air. However, producing oxygen requires a great deal of energy. Therefore, review ozone generator options, oxygen source options, and dry-air options to ensure the most cost effective and energy efficient option for long-term operation. When ozone is used for water treatment it is almost always more efficient to produce ozone from oxygen due to the increased ozone concentration and increased solubility of ozone into water. Ozone generators producing ozone from air will be exposed to more potential for contamination of the ozone generating cell and may require more maintenance than ozone generated from oxygen. 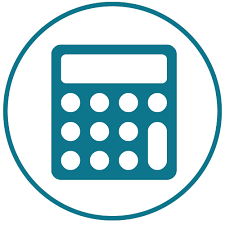 If using an oxygen concentrator factor the maintenance costs of the oxygen concentrator or air compressor in your system operational costs. 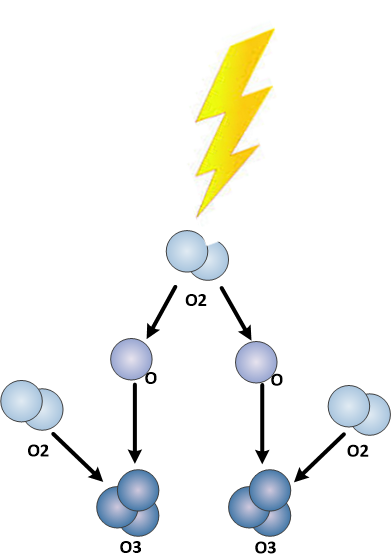 Converting oxygen to ozone requires an energy transfer. This energy transfer will produce heat as a by-product. This heat must be removed from the ozone generator either with fans for air-cooling, water for water cooling, or both. Most small ozone generators are air cooled, most large ozone generators are water cooled. Air cooled ozone generators are simple and require less overall system components. Therefore, air cooled ozone generators are commonly used for small to mid-sized ozone applications. As the scale of ozone production increases the heat-load increases, therefore large ozone generators are all water cooled as air cooling would not be a reasonable option. Air cooled ozone generators will typically run warmer than water cooled ozone generators and produce ozone less efficiently. Therefore, lower ozone concentrations are typical, along with higher feed-gas flows required. Water cooled ozone generators require cooling water passing near high voltages used for ozone production. This can be a safety hazard in some locations, most notably dirty environments where air quality is poor and dirt may build-up on the ozone generator components. Ozone can be produced via UV light, corona discharge, or electrolytic. Click link below for more details on how these methods work. Overview listed here. Ozone is produced from air at very low concentrations. UV light cannot produce ozone at higher concentrations than about 1% by weight, and most are far below that. A UV ozone generator is a great option for high flow – low concentration ozone applications. Air treatment applications commonly use UV ozone generators with great success. Due to the low concentration of ozone production UV ozone generators are not applicable for many water treatment application. Also, UV ozone generators are not cost effective at ozone production rates greater than about 10 g/hr. Most every industrial ozone generator uses corona discharge to produce ozone. Ozone can be produced at up to 20% by weight with no limit to ozone production. Ozone is produced from oxygen or dry-air, if air is used it must be dry duet to by-product creation in the ozone generation process. Ozone is produced electrolytically directly within water, this eliminates the need for gas to liquid contacting equipment used for UV or Corona Discharge ozone generators. Water must be very clean for electrolytic ozone production due to contamination and break-down of the anode and cathode used for this method. When ozone is produced via corona discharge the corona cell must use an anode, cathode and dielectric barrier material. There is a wide variety of materials in use today, each with distinct advantages and disadvantages. Ceramic dielectrics are used in a wide variety of forms. Most all flat plate ozone generators use ceramic dielectrics, a thin square sheet is used and sealed against a flat anode and cathode with a gap on side. Ceramic coating is used as the dielectric barrier in some ozone generators. These are normally a round tube in a concentric tube. Concentric ceramic tubes are used in some tube style ozone generators. These will range greatly in thicknesses. Quartz is used in many concentric tube ozone generators. Quartz offers a consistent dielectric with great heat resistance. Deposits do not form on quartz as easy as on ceramic, and quartz is easier to clean if ever necessary. Quartz can be formed in many shapes to allow more flexibility in corona cell designs. Some ozone generators use a double quartz dielectric design that insulates the ozone gas from ever touching either the anode or cathode. This configuration eliminates the need for concern on anode or cathode construction. The most common material in ozone generator construction is stainless steel. Readily available, reasonable ozone resistance and low cost make stainless steel the go-to for most ozone generator construction. Stainless steel is used for both anode and cathode material in many ozone generators. Stainless steel is very ozone resistant, but is not a great conductor of heat. Aluminum is used in many air cooled ozone generators, and some air cooled ozone generators. Aluminum is a great conductor of heat and with newer aluminum materials is very ozone resistant. Aluminum does not hold up to ozone by-products well, and therefore is normally only used with oxygen feed-gas. Titanium is used as an anode material in some ozone generators. Titanium offers a great compromise for wear, material compatibility, and heat transfer. Ozone generator design will affect the corona cell operating pressure. Ozone generators may be designed to operate under vacuum or pressure, or both. The vacuum or pressure available will affect the suitability of the ozone generator for specific applications, or alter your system configurations. Operating under a vacuum is a great method to eliminate ozone leaks. If the ozone generator is operating on dry air it is possible to pull ozone gas from the ozone generator and air dryer keeping the system under a vacuum and minimizing moving parts on the system. Operating under pressure is ideal when the application requires ozone gas to be pressurized. The higher pressure the ozone generator can operate at, the more flexibility your system will have for operation. Boosting ozone pressure after the ozone generator is a less than ideal option as it creates excess heat, destroys ozone, and creates additional leak points. Some ozone generators can operate under vacuum or pressure. This is excellent when feed-gas is pressurized and a venturi injector creating a vacuum is used. Implementing an ozone generator with the flexibility to operate under a vacuum or pressure allows for an extremely easy to operate and reliable system. A higher priced ozone generator that is more efficient at producing ozone and requires less feed-gas may reduce the cost of an oxygen concentrator other equipment. Spending more for the ozone generator may lower the capital cost and/or operating cost of the system long-term. There are extremely low-priced, imported ozone generators on the market. These should be used with caution but may be useful when long-term reliability is not important, such as short-term pilot tests or lab testing. Ozone generator quality ranges dramatically. Extremely low priced, low quality imported ozone generators are on the low end, while specialty ozone generators manufactured for specific high-end applications are available. The quality and reliability may range dramatically. A few points to consider are listed below. Many low cost imported ozone generators have poor reliability, but more importantly, replacement parts are commonly not available, or not worth installing. Consider these to be disposable machines. Certainly, disposable equipment has a place in any industry, and even in the ozone industry, there is a reasonable place for this equipment when used with the proper expectations. Ozone generators manufactured in North America actually use many common components. While there are a variety of manufacturers, many of the components used are similar This is an advantage for long-term availability of replacement parts. When considering an ozone generator for your application review if these controls are required, and if they are available on the ozone generator you are considering. Choosing the right ozone generator for your application should be done considering all the potential variables and metrics relevant to your application. Ozone is simple to produce, applying ozone properly to your application is not as simple.